Sega Royal Ascot 2 DX - Gate Door Right WYT-2065 is suitable for Sega Royal Ascot 2DX machine. Royal Ascot 2 DX is a coin operated, medal horse racing machine based on the world famous race held in the UK - the Royal Ascot. Watch and cheer on your horse as they make their way around the track. Since the manufacture of these parts has been discontinued, Gate Door Right WYT-2065 part is becoming harder and harder to locate - so don't miss out on this opportunity. 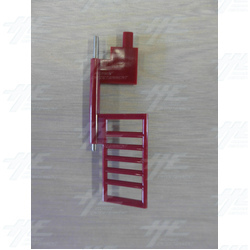 Sega Royal Ascot 2 DX - Gate Door Right WYT-2065 is suitable for Sega Royal Ascot 2DX machine. Royal Ascot 2 DX is a coin operated, medal horse racing machine based on the world famous race held in the UK - the Royal Ascot. Watch and cheer on your horse as they make their way around the track. Since the manufacture of these parts has been discontinued, Gate Door Right WYT-2065 part is becoming harder and harder to locate - so don't miss out on this opportunity.